The geranium is a lovely and versatile flowering plant that is grown around the world. Native to South Africa, some geranium varieties are annuals, while others are perennials. While geraniums are noted for their stunning flowers, there are some types that are appreciated for their scents. Among the fragrant geraniums are rose, orange, apple and peppermint. Geranium is the botanical name for the flowering plant family. Within the geranium family are many different species. Besides being annuals and perennials, the geranium family includes woodland wildflowers. The flower of the geranium blooms all season in single or double flowers. When cultivated from seed, geraniums take about five months to flower. Geraniums are typically used as hanging plants, border flowers, bedding plants, potted plants and as window box accents. Geraniums range in height from six inches to four feet. The common zonal geraniums are used mainly as potted plants and grow 12 to 18 inches tall. The colors of the blooms vary, with red, pink, magenta, violet, purple, white and salmon the most common. Geranium foliage is green, but during cool temperatures a reddish tint may appear on the leaves. Although they are flowering plants, geraniums do not require the soil to be constantly moist. They should only be watered when the soil becomes dry. 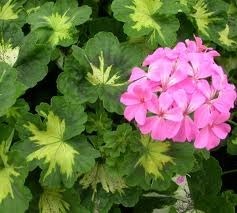 But as flowering plants, geraniums need nutrients in the form of fertilizer. When planting geraniums in the ground, fertilize the soil with a time release mixture that has extra phosphorous. This will allow the plant to develop good, strong roots. Fertilization should continue into late summer. Geraniums growing in containers need more frequent feedings of fertilizer since waterings wash it away. At the same time, old growth and dying buds and leaves should be pinched off to encourage new growth. 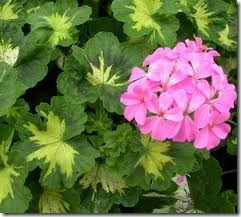 The fastest way to grow geraniums is to start with young plants rather than seeds. One plant can produce several four-inch cuttings that can be planted either indoors in a pot or outdoors in the spring after the last frost. For a bushy geranium plant, cut stems back to about 1/2 of their growth in the spring. Geraniums grow best in partial shade in soil that drains well and has a pH balance of between 6.0 and 6.5. Although geraniums are hardy enough to tolerate cool weather and will continue to bloom well into the fall, they cannot survive a frost. The geranium variety Pelargonium odorantissimum contains essential oils that provide an array of health benefits. Extracted from the plant’s stem and leaves, the oils are used as an astringent to improve skin and muscles, as a cytophylactic to promote healthy cell growth and as an antibacterial oil to prevent infection in cuts and wounds. Other uses for geranium essential oil are as a deodorant, tonic, diuretic and a cicatrisant to fade away scars and other spots on the skin.